Below are my thoughts from the daily Bible reading of the West Side Church of Christ. Today’s reading comes from 1 Kings 7 & 2 Chronicles 4. Before reading I invite you to pray and asked God to speak to you as you read his word. Also above in the tabs is a link to the Bible reading plan. Our reading today began with Solomon constructing his personal palace. In reading the details of Solomon’s palace we first might get the idea that Solomon built a much bigger and better home for himself than he did for God. However that is not necessarily the case. I want to turn to the words of James Smith, Old Testament professor and scholar. He writes …. Solomon’s palace may have been bigger than the Lord’s Temple, but we have to remember it served a different purpose. 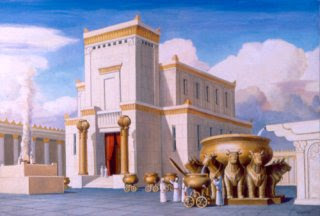 God’s Temple was the place where God resided and offerings to God were made. The palace was the home of Solomon, it was the treasury and armory for the nation, it was a gathering place for people waiting to see the king and for court appearances, it is where court proceedings took place, and it was the home to Pharaoh’s daughter. So while much larger, we must remember it served more than one purpose. The palace had to be large to serve its role. Smith, James. The Books of History. Joplin: College Press, 1995. 435. Print.